When we analyze the carrot juice, there's a high amount of rhodium in carrot juice. I've heard of people drinking macro amounts of carrot juice and curing cancer. Well rhodium is the cancer cure. And if you have cancer you need rhodium in your body. Another one of the highest natural sources of rhodium and iridium, is Aloe Vera. It's also found in Essiac Tea, sheep sorrel and slippery elm bark. They have not found any toxicity even in mega levels, so if you got somebody who's really sick that's probably their best chance of recovery is the high amounts of rhodium. It is particularly great for people who have mouth cancer, throat cancer, stomach cancer, colon cancer, prostate cancer any cancer of the soft tissues. The one area it doesn't seem to work is cancer of the lymphatic system. Cancer cells were placed in culture dishes and raised to maturity. When rhodium was dispersed in the deionized water and added to the cancer culture they attracted to the cancer cells but did not affect the cells' activities. However, when the rhodium is reacted with diluted hydrochloric acid and then introduced as a chloride into the cancer cells, the activities of the cells reduced by 45% to 55%. This truly amazed the researchers. They had previously seen materials which would kill cancer cells and they had seen other materials which had no adverse effect on the cancer. But they had never before seen a material that literally changes the nature of the cancer cells and made them normal! Its effects on growth of cancer cells is cell type specific. It inhibits growth of liver cancer cell lines and the prostate line H23, but not the growth of other cell types. It actually stimulates the growth of PC3 cells and mink lung epithelial cells. It inhibits the production of cytokine in PC3 cell and mink lung epithelial cells, which suggests the rhodium ORME may have anti-inflammatory activity. 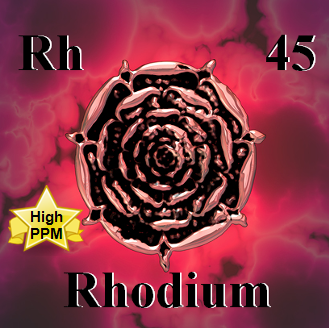 Rhodium ORME is clearly not toxic, even at very high concentration. Thus its anti-cancer action can not be via a cancer cell-killing mechanism, it actually trasnmutes the cell by some other means.